Prayer flags Prayer flags are colored pieces of cloth that have Buddhist sutras printed on them. They are strung up at mountain passes and along trails and streams and are attached to chortens, temples and other sacred structures so their prayers can be released in the wind to purify the air and appease the gods. When the flags flutter in the wind, Tibet Buddhists believe the sutras on them are released to heaven and this bring merit to the people who tied them. 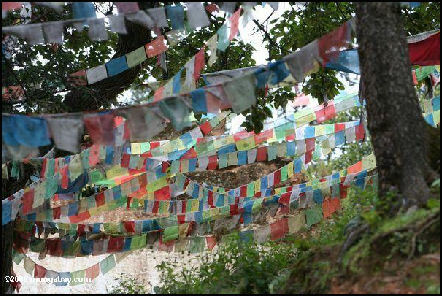 The tradition of tying prayer flags evolved out of worship for the God of Soil, and important Bon deity in Tibet before the arrival of Buddhism. Most prayer flags today are woodblock printed. Some shops are now starting to produce prints made from zinc faced blocks that can be etched photographically resulting in finer detail than the hand carved woodblock. Natural stone ground pigments have been replaced by printing inks, usually having a kerosene base. Most of the companies in the west prefer to use silkscreen printing techniques as wood carving is a time consuming skill requiring lengthy apprenticeship. When the Chinese took over Tibet they destroyed much of everything having to do with Tibetan culture and religion. Prayer flags were discouraged but not entirely eliminated. We will never know how many traditional designs have been lost forever since the turmoil of China’s cultural revolution. Because cloth and paper prints deteriorate so quickly the best way to preserve the ancient designs is by saving the woodblocks. Woodblocks, often weighing several pounds, were too heavy for the refugees to lug over the Himalayas and woodblocks no doubt made wonderful firewood for Chinese troops. Most of the traditional prayer flags today are made in Nepal and India by Tibetan refugees or by Nepali Buddhists from the Tibetan border regions. The wind horse (longa) is the main symbol found on prayer flags. On his back the horse carries the Three Jewels of Buddhism---the Buddha, dharma, and sangha. The colors on prayer flags is highly symbolic. Red represents fire; green, wood; yellow, earth; blue, water; and white, iron. In Tibet, a distinction was made between Buddhism and folk religion (usually a reference to Bon). Windhorse was predominantly a feature of the folk culture, a "mundane notion of the layman rather than a Buddhist religious ideal," as Tibetan scholar Samten G. Karmay explains.However, while "the original concept of rlung ta bears no relation to Buddhism," over the centuries it became more common for Buddhist elements to be incorporated. In his 1998 study “The Arrow and the Spindle,” Karmay traces several antecedents for the wind horse tradition in Tibet. First, he notes that there has long been confusion over the spelling because the sound produced by the word can be spelt either klung rta "river horse" or rlung rta "wind horse". In the early twentieth century the great scholar Jamgon Ju Mipham Gyatso felt compelled to clarify that in his view rlung rta was preferable to klung rta, indicating that some degree of ambiguity must have persisted at least up to his time. 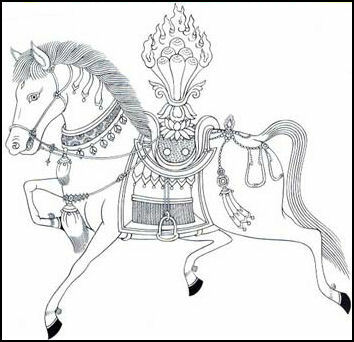 Karmay suggests that "river horse" was actually the original concept, as found in the Tibetan nag rtsis system of astrology imported from China. The nag rtsis system has four basic elements: srog "vital force", lus "body", dbang thang "field of power", and klung rta, "river horse". Karmey suggests that klung rta in turn derives from the Chinese idea of the lung ma, "dragon horse," because in Chinese mythology dragons often arise out of rivers (although 'brug is Tibetan for dragon, in some cases they would render the Chinese lung phonetically). Thus, in his proposed etymology the Chinese lung ma became klung rta which in turn became rlung rta. Samtay further reasons that the drift in understanding from "river horse" to "wind horse" would have been reinforced by associations in Tibet of the "ideal horse" (rta chogs) with swiftness and wind. On prayer flags and paper prints, windhorses usually appear in the company of the four animals of the cardinal directions, which are "an integral part of the rlung ta composition": garuda or kyung, and dragon in the upper corners, and White Tiger and Snow Lion in the lower corners. In this context, the wind horse is typically shown without wings, but carries the Three Jewels, or the wish fulfilling jewel. Its appearance is supposed to bring peace, wealth, and harmony. The ritual invocation of the wind horse usually happens in the morning and during the growing moon. The windhorse ceremonies are usually conducted in conjunction with the lhasang ("smoke offering to the gods") ritual, in which juniper branches are burned to create thick and fragrant smoke. This is believed to increase the strength in the supplicator of the four nag rtsis elements mentioned above. Often the ritual is called the risang lungta, the "fumigation offering and (the throwing into the wind or planting) of the rlung ta high in the mountains." The ritual is traditionally "primarily a secular ritual" and "requires no presence of any special officiant whether public or private." The layperson entreats a mountain deity to "increase his fortune like the galloping of a horse and expand his prosperity like the boiling over of milk. 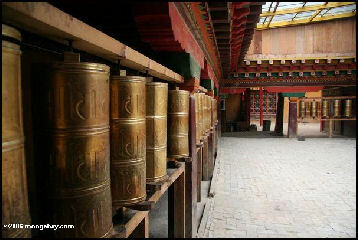 Prayer wheels are devices inscribed with mani prayers and containing sutra scrolls attached to their axels. Each turn of a prayer wheel represents a recitation of the prayer inside and transports it to heaven. Varying in size from thimbles to oil drums, with some the size of buildings, prayer wheels can be made of wood, copper, bronze, silver or gold. They can be turned by wind or water or rotated by hand and are often stuffed with prayers handwritten in pieces of cloth. Some prayer wheels have handles and look like devices that take up string on a kite. Others are large and hang from temples with thousands of prayers inside that when unraveled are more than a mile long. Pilgrimage paths (koras) are often lined with prayer wheel. Pilgrims spin the wheels to earn merit and help them focus on the prayers they are reciting. Hand-held prayer wheels are carried by pilgrims and other devotees and turned during devotional activities. Rolls of thin paper, imprinted with many, many copies of the mantra (prayer) “Om Mani Padme Hum,” printed in an ancient Indian script or in Tibetan script, are wound around an axle in a protective container, and spun around and around. Typically, larger decorative versions of the syllables of the mantra are also carved on the outside cover of the wheel. Tibetan Buddhists believe that saying this mantra, out loud or silently to oneself, invokes the powerful benevolent attention and blessings of Chenrezig, the embodiment of compassion. A prayer wheel is generally a hollow metal cylinder, often beautifully embossed, mounted on a rod handle and containing a tightly wound scroll printed with a mantra. The external cylinder of a prayer wheel is made out of repoussé metal, usually gilded bronze. The wheel is supported on a handle or axis made of wood or a precious metal. On the outside of the cylinder are inscriptions in Sanskrit (or sometimes Tibetan) script (often Om mani padme hum) and auspicious Buddhist symbols. This outer part is removable to allow for the insertion of the sacred text into the cylinder. The uppermost point of the prayer wheel forms the shape of a lotus bud. The cylinder contains a sacred text written or printed on paper or animal skin. These texts might be sutra or invocations to particular deities (dharani or mantras). The most common text used in prayer wheels is the mantra Om mani padme hum. Prayer wheels come in many sizes: they may be small and attached to a stick, and spun around by hand; medium-sized and set up at monasteries or temples; or very large and continuously spun by a water mill. But small hand-held wheels are the most common by far. Tibetan people carry them around for hours, and even on long pilgrimages, spinning them any time they have a hand free. Prayer wheels at monasteries and temples are located at the gates of the property, and devotees spin the wheels before passing through the gates. Larger wheels, which may be several yards (meters) high and one or two yards (meters) in diameter, can contain myriad copies of the mantra, and may also contain sacred texts, up to hundreds of volumes. They can be found mounted in rows next to pathways, to be spun by people entering a shrine, or along the route which people use as they walk slowly around and around a sacred site -- a form of spiritual practice called circumambulation. Theoretically, Buddhist prayer wheels are allowed to slow down but never to stop. They are generally spun very quickly in a clockwise fashion. The merit earned from the written prayer (usually om mani padme hum written in Tibetan or Sanskrit) is regarded as weaker than that of a spoken prayer. The more prayers one offers, the more merit he or she earns, which improves his or her chances or receiving a higher reincarnation and eventually achieving nirvana. Yak grease is used on the handle to make them spin more quietly. Mani stones Mani stones are flat-surfaced stones carved by Buddhist devotees to earn merit. Most are inscribed with prayer "om mani padme hum" ("Hail to the Jewel in the Lotus"). They are often placed alongside trails near Tibetan-style monasteries and temples. In some places you can find prayer walls, hundreds of meters long composed of mani stones. Travelers should always pass these walls on the left and consequently most prayer walls have trails on both sides. Mani stones are called Man Zha in Tibetan, meaning “Sanskrit mandala.” In remote areas, far from temples, they serve as prayer halls and shrines for local Tibetans that otherwise have difficulty reaching more conventional places of worship. Upon encountering a mani stone mound, Tibetan people circumambulate it clockwise as a prayer offering for health, peace, and protection. As a way to earn merit some devout Tibetans pick up a stone and touch it to their forehead, while murmuring mantras and then drop the stone on the mound. This way the mounds get larger and larger. Objects with divine connections such as skulls, horns and the wool of animals and even human hair can be added to the mound. It is believed that requests made to Buddha are answered by circumambulating the mound. The world's largest Mani stone mound is located in Xinzhai Village of Yushu Tibetan Autonomous Prefecture of Qinghai province. Said to have been started by the first Rinpoche of Jiana after he settled in Gujie Monastery in Xinzhai, the mound became bigger and bigger over the centuries and now reportedly contains 2.5 billion stones. 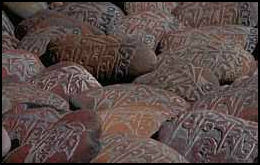 Tens of thousand Mani stones are engraved with words of law, calendar calculation, art theory, sutra texts and Buddha carvings. Mani stones are regarded as a sacrifice to the Buddha. They can feature different colors and shapes and have different images and texts engraved on them but most are simple ones with the mantra are 'Om Mani Padme Hum'.Mani Stone handicraftsmen are generally peasants or herdsmen in spring, summer and autumn. They only engrave stones in winter. In the old days, Mani stones contained Buddhist texts incantations and mottos accompanied by painted and engraved images to educate illiterate people. Mani stone walls may be inscribed with characters and pictures produced by an artist. They commonly have the mantra “Om Mani Padme Hum” accompanied by images of deities, monsters, strong animals and other Buddhist-related images. These walls are found near temples and monasteries and can be seen on cliffs faces in Lhasa and Shigatse and other areas. Some regard Mani stones like patron saints that can be stored in a house or taken along when going out. Weisang is an ancient and widespread Tibetan custom. According to the traditional Weisang ritual: first cypress and juniper branches and herbs piled up and lit. In the fire and smoke roasted barley flour or grain is placed along with a few drops of holy water. Weisang is done on many occasions, such as to celebrate a bumper harvest, ward off attacks by enemies, defeat an opposing team, bring peace and prosperity, attract good luck to a weddings or funerals, ensure safety on a road trip, and ward off illnesses. As an everyday act of worship, Tibetans commonly burn some cedar or juniper branches with herbs outside temples and monasteries and in front of the gates at their homes to eliminate the evil and purify the air. According to the legend, Weisang came from the ancient tribal custom of welcoming brave fighters returning in triumph. In order to clean off the dirt and dust—and perhaps traces of fighting and death—people burned herbs and a pile of cypress and juniper branches, which were dipped in water, then waved on the fighters. Over time this custom was adopted as a kind of sacrifice to the gods, a prayer for peace and victory, and means of communicating with gods. After a woman has given birth, people burn yak dung in front of gate to inform they are not supposed to enter and to get rid of the polluting atmosphere produced by procreation. Then people pile up a scree pile. If a boy is born, people pile up more chalk scree. If a girl is born, people use other kind of scree and light Wei-Song nearby. At New Year’s time Tibetans burn mulberry branches to keep evil from entering the house.